Christmas is the time of year for giving, so this year why not pick something extra special for your loved ones . . .
At the London Local Christmas Market our makers’ products boast an array of bespoke, hand-made, quality gifts that you can’t find at any old run of the mill high street shop. Always eager to help you find what you are looking for, many of our makers offer extra services, whether that means getting something personalised, made to an exact fit, and even a one-off product. It means that this year you can give that perfect gift. ALL OF THE MAKERS AND PRODUCTS MENTIONED BELOW WILL BE ON SALE AT OUR UPCOMING LONDON LOCAL CHRISTMAS MARKET AT HORNSEY TOWN HALL, CROUCH END, LONDON. ON SATURDAY 3RD – SUNDAY 4TH DECEMBER 11AM-5PM. Hi, my name’s Charlotte, I am the owner of Chalk Designs, a jewellery creative which focuses on making beautifully hand carved jewellery for our customers to treasure for years to come. A tiny Robin with his rose golden tummy; these gorgeous birds are my favourite winter visitors, and a sprig of Mistletoe; reminding me of the love I feel when surrounded by my family at Christmas. This is what this time of year really means to me. These sweet gestures of joy and love are a wonderful gift to give to someone who you really cherish this Christmas. AND SECONDLY I DECIDED THIS WOULD BE A GREAT OPPORTUNITY TO HAND SELECT OTHER MAKERS FOR THEIR CHRISTMAS INSPIRED GIFTS, ENJOY! 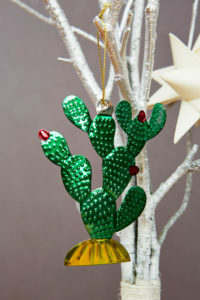 Not only this but you can also join Utensils0 for a festive craft workshop at the LoLo Christmas Market. In this workshop you’ll learn to make a 3D paper mistletoe sprig to hang in your doorway, to decorate your table or to add a handmade touch to your christmas wrapping. In an hour and a half you’ll have your own handmade decoration and the knowledge to keep making festive plants which will last the whole season! Christmas cards are a must purchase at any craft fair this time of year. They’re full of festive fun and wont break the bank. These Sophie Louise Designs are especially cute and jolly with their bright playful illustrations, bound to make anyone who receives them smile. Sophie also hand makes these vibrant screen printed stockings, which can also be personalised with the recipients name around the top band, giving this gift a bit of added thoughtfulness. But don’t just give stockings to the kids this year, at this price you can afford to wrap up your friends and families presents in these stockings and be prepared to see their eyes light up. The reflective woollen accessories made by Saffie Pluck are some of the most innovative and popular products the LoLo team boast. Having been an Etsy Awards Finalist this year Pluckd Designs’ popularity is ever rising, so get your orders in fast! Inspired by the city dweller, these garments lend themselves both to day time comfort and warmth, and allowing the wearer to be seen from afar by lighting them up in their nighttime urban jungle. Why not think about giving these garments as gifts to the children in your life and getting a parent stamp of approval, plus the city dwellers who they were designed for and who not only want to keep safe but also enjoy standing out from the crowd. Usually used as decoration in the spring and summer months, Monica has brought us some wonderfully vintage Christmas inspired bunting to liven up our homes during the festive season. It’s so nice to find Christmas decorations that are easy to use and suit the style of so many on trend home styles. Lovingly hand sewn using quality festive fabrics, and made up of 6 double-sided flags, so both sides of the bunting look pretty and you can be sure of a long-lasting item. It measures around 2 metres in length with 30cm at either end for ease of hanging and each flag measures 15cm wide by 19cm tall. BRINGING JOY TO THE WORLD, ONE BUNTING FLAG AT A TIME! 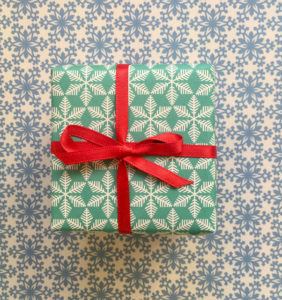 The new snowflake collection of gift wraps from Elvira V VDesigns are perfect for a sophisticated holiday wrap. With bold and modern illustration, mixed with cleancool colours; choose from turquoise, blue, blue ice and grey. This wrapping is a great starting point for your friends and families beautifully wrapped Christmas presents, making sure the presentation is just as beautiful as the gift inside it. Matching Snowflake greetings cards are also available, for those people in your life who appreciate something to look fab on their mantle. All of PJMamma’s products are created with comfort at their heart and designed by a Mamma who knows the little touches that make a big difference. Made using 100% Organic Cotton and best quality waterbed inks helping to give mamma and baby the ultimate snug factor. My favourite by far are the reindeer designs with large pom pom noses, they have the cute factor! With matching Christmas PJs for mamma and new born baby, what better way to celebrate a first Christmas, how can anyone resist?! For me there is nothing better than bright Christmas decorations to go on my ever increasingly colourful Christmas Tree, but I’ve never seen anything like these beauties before. Being hand cut, pressed and painted in Mexico City, along with the strong colours and lustre make these decorations truly stand out in a crowd. But the unique and quirky designs make these more than just Christmas decorations, these can be displayed all year round. You might think that Dinosaurs have nothing to do with Christmas, but not to feel left out, at the Charlotte Filshie headquarters they’re busy getting into the festive spirit. 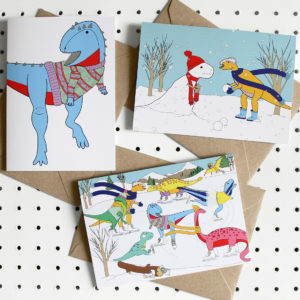 Wearing all sorts of festive jumpers, going ice skating, getting tangled up in fairy lights, making snow-dinosaurs, is there nothing this group of Dinos wont get stuck into this holiday? 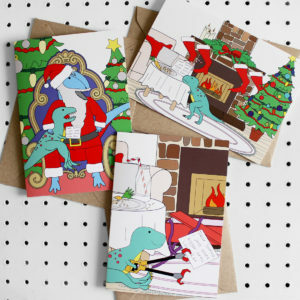 If you think this is just for kids, think again, because this humorous Christmas range of Dinosaur antics is perfect for making your friends and family smile, even before they’ve opened their presents!